Archtober Building of the Day #11 Glen Oaks Branch Library 256-04 Union Turnpike, Queens Marble Fairbanks The goal of libraries is to provide communities with access to resources, said Karen Fairbanks, founding partner of Marble Fairbanks. 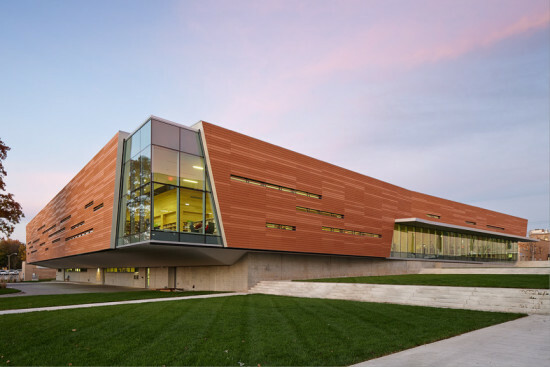 Before Fairbanks and a large team of fellow architects, landscape architects, and engineers designed the new Glen Oaks Branch Library, community members were yearning for a facility that could provide more resources that better serve their needs. Throughout the design process, the design team continued to return to the word “search”—it is projected across the facade of the building, changing its appearance based on time of day and season. Even in the age of digital resources, libraries remain hubs for people of all ages to search for answers and information. 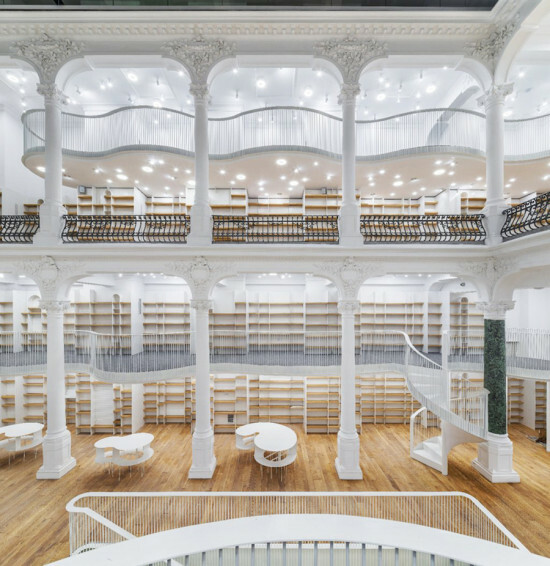 In their design, libraries today must achieve the proper balance of flexible space for programming and digital research as well as storage for printed materials. The brick library that previously stood on the site was small, uninviting, and lacked sufficient natural light. Overall, the building was not civic, said Fairbanks. 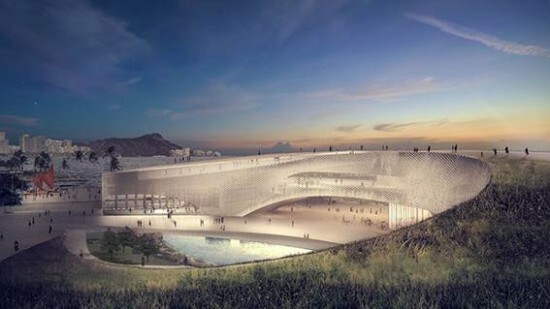 The design team set out to design a new structure that appeals to library goers, and adequately represents the area’s diverse community of 30,000 people speaking 30 different languages. The intricate design on the building’s glass exterior skin, developed by a complex algorithm, spells out the word “search” in 30 different languages to signify the community’s diverse demographic makeup. Each translation is accompanied by a series of lines representing the population size of each language represented. From a distance, it looks like rows of books. Each of the building’s three levels serves a distinct group—adults, teenagers, and children. Teens primarily use the main floor and the rear garden, or outdoor reading room. After school, this area is flooded with students. They can choose from a range of furniture types and feel comfortable doing homework or socializing. An open stairway with transparent glass railings leads to the basement level where adults, the largest group of library patrons, congregate. The stairwell creates an atrium allowing light to enter the lower level. Skylights embedded in the landscaping outside, over which visitors must walk to enter the library, also bring light in to the grand basement space. The perimeter of the basement reading room is wrapped in books for easy accessibility, with intimate reading areas arranged throughout. One of two community rooms is tucked in the back of this level. The top floor, reserved for children, is the quietest floor. Fairbanks noted that the carpeting and perforated ceiling absorb sound. Smaller chairs and tables and shorter bookshelves clearly indicate the target audience. Children can access materials and librarians can monitor the whole room. An LED art piece by Janet Zweig, commissioned by the New York City Department of Cultural Affairs as part of the Percent for Art program, hangs from the ceiling. On it, unanswerable philosophical questions scroll overhead. The stimulating installation is meant to inspire children and engage their sense of wonder and desire to “search.” The Glen Oaks Branch Library opened to the public in September 2013. 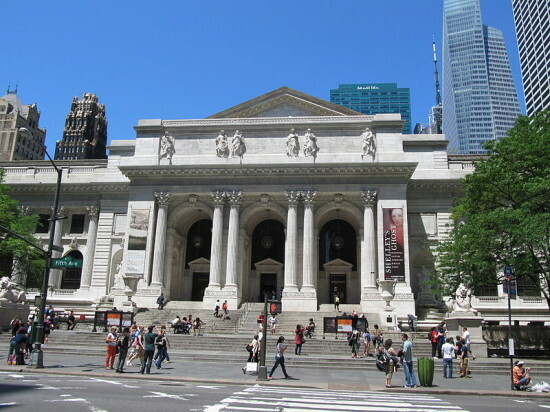 Five days a week, visitors flow naturally from the bus stop on Union Turnpike, to the sitting area outside the entrance made possible by the building’s setback on the site, and into the library. Emma Pattiz is Policy Coordinator for the AIA New York Chapter. Archtober Building of the Day #4 Stapleton Library 132 Canal Street, Staten Island Andrew Berman Architects Libraries, according to architect Andrew Berman, principal of Andrew Berman Architect, do not age gracefully. As technological innovations and transforming communities change the role of these public institutions, fixed programmatic layouts become obsolete. 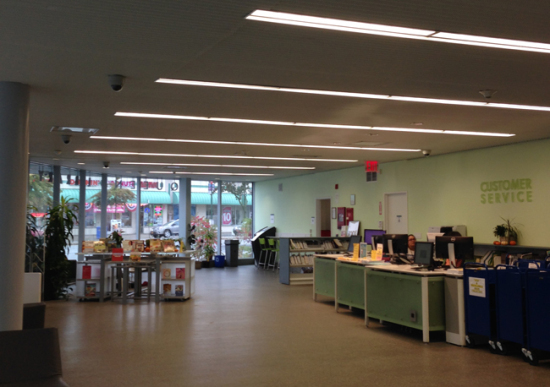 During a tour of Stapleton Library in Staten Island, Berman explained that flexibility and openness became two key components that guided its renovation and expansion. Originally designed by Carrère and Hastings, fathers of the main New York Public Library on 5th Avenue, the Stapleton Library was suited to its small community. High ceilings and lofty proportions imbued the small structure with dignity, while varnished oak molding gave it a decidedly more rustic feel than its Manhattan relative. 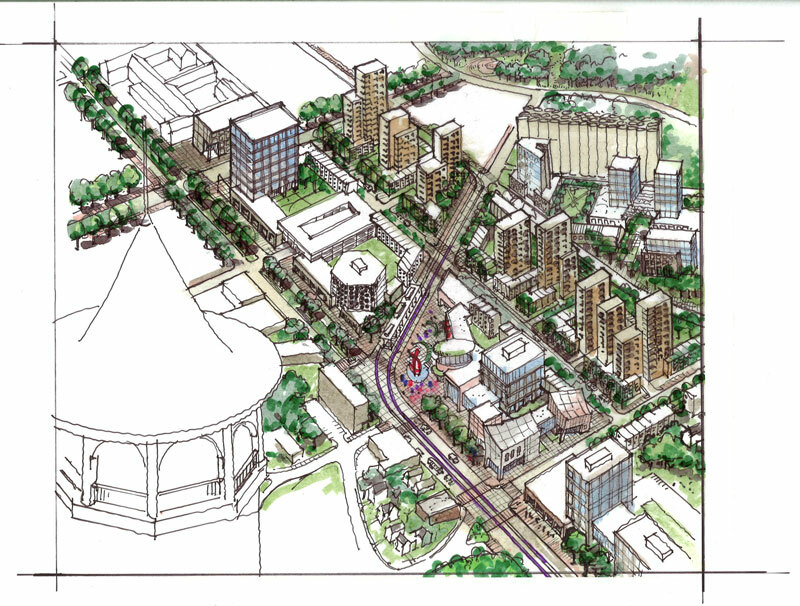 However, as Stapleton’s population increased and diversified, the Staten Island neighborhood outgrew its library, which became cluttered and poorly lit. Berman’s firm has carefully renovated the original 1907 building that now serves as a playful children’s area. The size of this space, he believes, is ideal for kids: large enough to create discrete areas for different programmatic needs. The new expansion has also doubled the space available to adult and young adult users. Afraid of compromising the building’s integrity through mimicry, Berman opted to handle the expansion as a separate structure, but one that remained in dialogue with the old. From the outside, the original masonry construction contrasts with the sleek transparency of the new space. 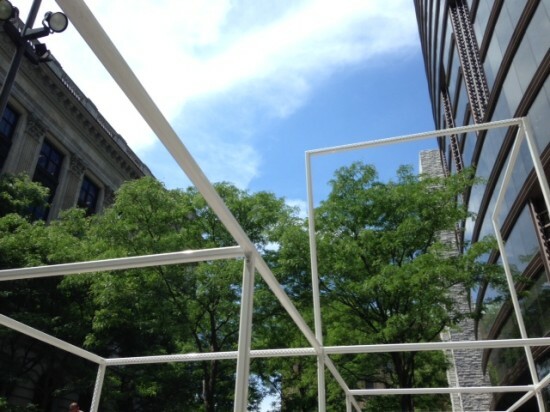 However, Berman’s careful use of proportion allows the two structures to harmonize. 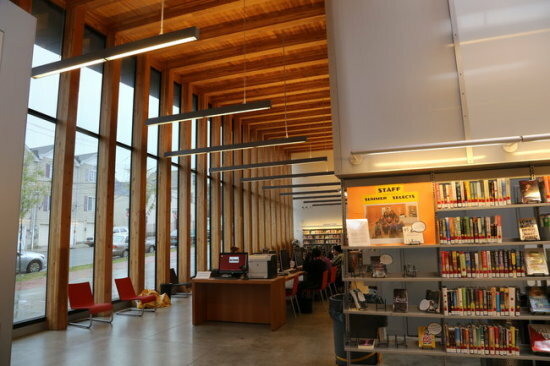 Meanwhile, the library’s interior is unified through the use of wooden structural beams, which reference the moldings and shelving in the original space. Books line the walls, freeing up corridors for study tables and computers. In addition, the central mechanical core is clad in translucent polycarbonate, adding to the sense of openness. A community room is used for group study sessions, and also houses programs from arts and crafts to aerobics classes. Today, Stapleton Library is, quite literally, a beacon for its community. 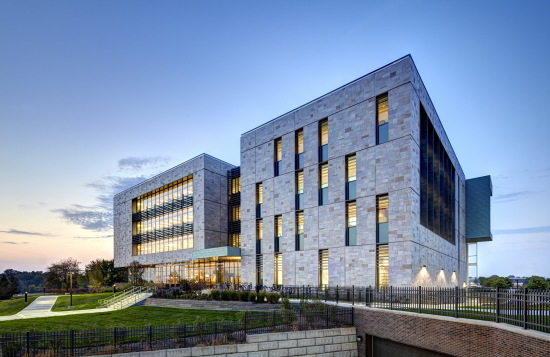 Berman’s expansion glows like a lantern at night, welcoming neighbors who often hang around outside even after closing hours to use the library’s Wi-Fi network. 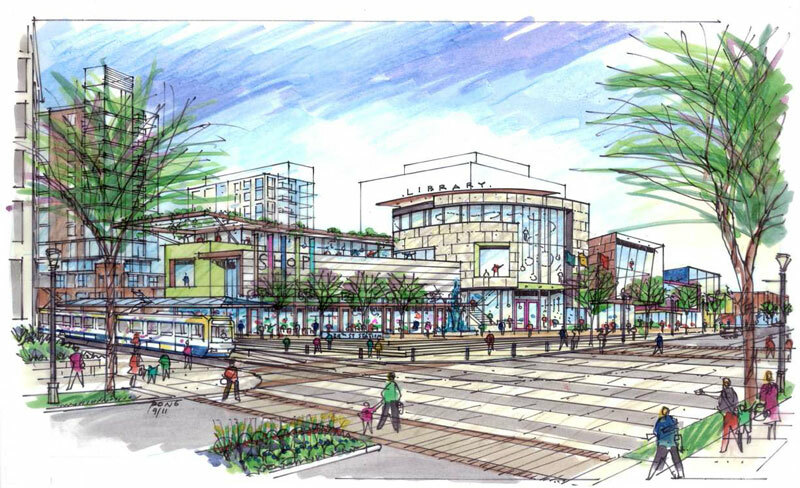 The architect hopes that the warmth, openness, and accessibility of the building will make it an inviting community space. Camila Schaulsohn is Communications Director and Editor-in-Chief of e-Oculus. She was born and raised in Santiago, Chile. 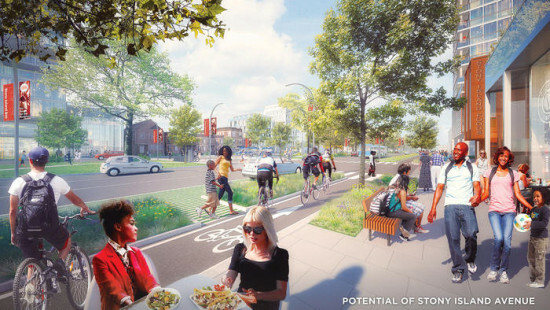 LAND Studio is also engaged in a makeover of Cleveland's downtown Public Square and a rails-to-trails project along Cleveland's old RTA Red Line. The Seattle Central Library celebrated its 10th anniversary this year on May 23rd with live music, free treats and refreshments, and guest appearances from some of the chief architects and minds behind the construction of the building. Regarded as the prize library of Seattle’s library system, the Seattle Central Library, designed by Rem Koolhaas' OMA, has also garnered criticism and acclaim for its unique architectural design. To celebrate the decade, AN has compiled a collection of ten great photos that will give the online viewer a virtual tour of Seattle's unique cathedral of reading. Unveiled to the public on May 23rd in the year 2004, the immense library can hold more than 1.4 million books and houses over 400 publically accessible computers. The library was the brainchild of the Office for Metropolitan Architecture (OMA) and LMN Architects who arrived at the conclusion that the library should stand out as the singular attraction of Seattle’s downtown area. The building features a glass exterior supported by a steel frame and was designed as an expression of creativity, modernism, and adaptation. The exterior of the library is unique and carries a quasi-abstract quality behind its design. The interior of the library was designed to accommodate the utilities or modern equipment on each floor, while still maintaining the integrity and basic structure of a classic library. This aspect of the library’s design is most evident in the renowned “book spiral”: a collection of non-fiction books that spans the length of four levels, ramping up in a manner similar to a parking garage. The exotic architectural design of the Seattle Central Library has been the target of praise by some critics but harsh reproach by others. 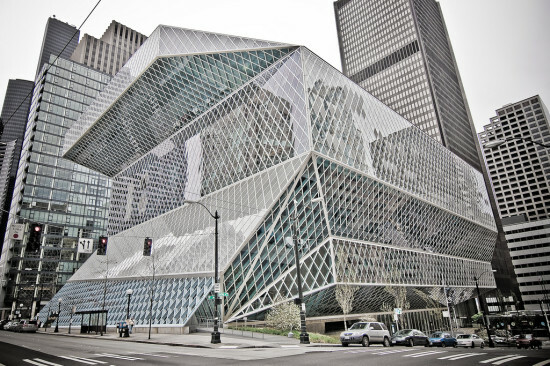 Despite critique or adulation, however, the Seattle Central Library irrefutably stands today as one of the most iconic buildings in the States.